A visit to the Kruger National Park is any wildlife-loving travellers' dream. For South Africans and international travellers, the park always leaves a safari impression that is hard to beat. The wonder and abundance of the park will never seize to satisfy. But some days - especially when the park is so busy that you cannot have a relaxed drive through it - you need to save your soul and head out. Set aside at least one day of your Kruger adventure to do some Kruger off-roading. No, we're not encouraging you to ditch the Kruger Park's rules and drive off the roads inside the park... Instead, make time to go exploring the incredible sights around the Park. Pilgrim's Rest came about 150-years-ago with the gold rush in SA. One lucky prospector, Wheelbarrow Alex as they called him, stuck gold in a creek near where Pilgrim's Rest soon popped up. The gold is gone today, but shopkeepers and the local townspeople still try to keep the original atmosphere of the 1870s. Pilgrim's Rest sits in an incredibly beautiful valley, surrounded by some of South Africa's most amazing waterfalls. Best is to explore these on foot, with a knowledgeable, local guide. The Sabie Town waterfall is typically the first and closest waterfall you'll walk to. Then, the Lone Creek Falls and Bridal Veil Falls are a couple of kilometres on. It takes 2.5-hours to view them both as the beautiful Bridal Veil Falls is in the pristine forest at the top of a mountain trail. The last falls to view is the Mac Mac Falls – so called because of all the Scottish prospectors in Pilgrim’s Rest at the time. 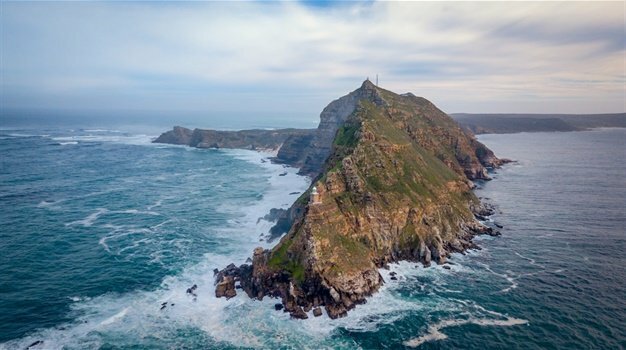 Elandela Lodge provides guided tours to the waterfalls, while Friends of the Pilgrim's Rest Museum offers educational, interactive tours where three guides, in character and period costumes, take you through a day in the life of Gold prospectors in the 1800's. Another awesome activity, fit for all ages, is Gold Panning in Pilgrim's Rest. Purchase a ticket at the Information Centre for a guided tour and experience. From your Pilgrim's Rest waterfalls adventure, you can easily slot into this route from Graskop, a small town in Mpumalanga that serves as the gateway to the Panorama Route. You can take the R532 from Graskop to the Blyde River Canyon that begins at Bourke’s Luck Potholes and ends at the Three Rondavels. Firstly, however, two more amazing waterfalls beckon. The Berlin Falls is first up, and then a few kilos on, the Lisbon Falls is the highest waterfall in the area at an awe-inspiring 92m! 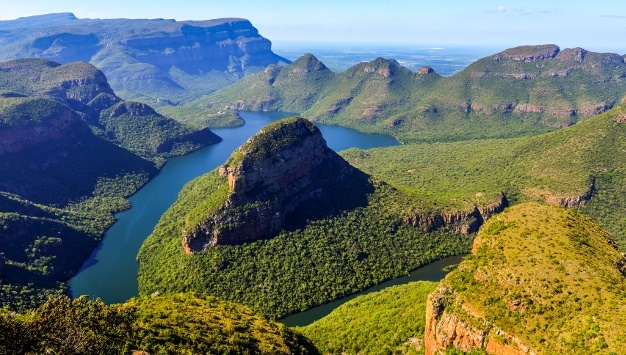 Once you're through Graskop, head on to the Blyde River Canyon Reserve and let the adventure start. You can hike all the way along the cliff in the reserve, 800m above the Blyde River Canyon. First up is Bourke's Luck Potholes. These giant potholes have formed at the confluence of the Blyde and Treur Rivers and mark the beginning of the Blyde River Canyon. Look out for the Three Rondavels - spectacular peaks which look exactly like rondavels, or traditional African huts. When you're overlooking these, you'll be standing on a viewpoint 1 380m above sea level, with the Blyde River Canyon below. Be surefooted here, especially as there's no rail. You can also opt for hot-air balloon ride, for another surreal view of this part of the country. Some of the Panorama Route's lesser-known but no-less fascinating attractions are clustered around Ohrigstad. Here, the Echo Caves extend for 40km into the rock, creating a unique limestone spectacle. At Ohrigstad Dam Reserve you can also fish for yellowtail or carp - an ideal breakaway from the crowds in peak season. If fishing is too mild for your taste, let's crank up the adventure a few notches for you. If you're into mountain biking, ride out with Mountain High Cycle Tours to get a different perspective of what makes Sabie such a great and diverse place. You'll get to experience the Blyde river canyon on your bike, or get down and dirty on the lovely single tracks in Graskop forests. If you're in a group, don't fret. Most of the MTB tour groups, including Mountain High Cycle Tours, cater to all fitness levels. It might be winter, but the mild weather up north offers no excuse to get wet with white water river rafting this time of year. Go River Rafting with Idle & Wild for a memorable experience along the river through the natural bush of the Sabie River Valley. They also offer other adventure outings, like quad biking, and have experienced guides and approved equipment. If you're after some belly-aching laughs with the family, Misty Mountains on the Long Tom Pass also recently opened their Toboggan down Long Tom Pass! Starting at an altitude of 1 700 metres, the thrilling ride takes bobsledders through the picturesque, rolling hills of Long Tom Pass. Dropping 115 metres from the start to finish, it takes approximately four and a half minutes to reach the bottom. You can also opt to explore the forest zip-slides - at 90km/h. Experienced guides will give you step-by-step instructions before you climb up a 55m-high platform, before you're hooked onto the 450m-long zipline. Anyone can play, you just need to fit into the harness provided!